The Aterian is a Middle Stone Age (or Middle Palaeolithic) stone tool industry centered in the Maghreb, but also found in Oman and the Thar Desert. The earliest Aterian dates to c. 145,000 years ago, at the site of Ifri n'Ammar in Morocco. However, most of the early dates cluster around the beginning of the Last Interglacial, around 130,000 years ago, when the environment of North Africa began to ameliorate. The Aterian disappeared around 30,000 years ago and it is currently not thought to have influenced subsequent archaeological cultures in the region. The Aterian is primarily distinguished through the presence of tanged or pedunculated tools, and is named after the type site of Bir el Ater, south of Annaba. Bifacially-worked, leaf-shaped tools are also a common artefact type, and so are racloirs and Levallois flakes and cores. Items of personal adornment (pierced and ochred Nassarius shell beads) are known from at least one Aterian site, with an age of 82,000 years. 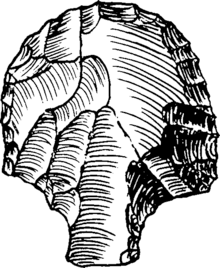 The Aterian is one of the oldest examples of regional technological diversification, evidencing significant differentiation to older stone tool industries in the area, frequently described as Mousterian. The appropriateness of the term Mousterian is contested in a North African context, however. The technological character of the Aterian has been debated for almost a century, but has until recently eluded definition. The problems defining the industry have related to its research history and the fact that a number of similarities have been observed between the Aterian and other North African stone tool industries of the same date. Levallois reduction is widespread across the whole of North Africa throughout the Middle Stone Age, and scrapers and denticulates are ubiquitous. Bifacial foliates moreover represent a huge taxonomic category and the form and dimension of such foliates associated with tanged tools is extremely varied. There is also a significant variation of tanged tools themselves, with various forms representing both different tool types (e.g., knives, scrapers, points) and the degree tool resharpening. More recently, a large-scale study of North African stone tool assemblages, including Aterian assemblages, indicated that the traditional concept of stone tool industries is problematic in the North African Middle Stone Age. Although the term Aterian defines Middle Stone Age assemblages from North Africa with tanged tools, the concept of an Aterian industry obfuscates other similarities between tanged tool assemblages and other non-Aterian North African assemblages of the same date. For example, bifacial leaf points are found widely across North Africa in assemblages that lack tanged tools and Levallois flakes and cores are near ubiquitous. Instead of elaborating discrete industries, the findings of the comparative study suggest that North Africa during the Last Interglacial comprised a network of related technologies whose similarities and differences correlated with geographical distance and the palaeohydrology of a Green Sahara. Assemblages with tanged tools may therefore reflect particular activities involving the use of such tool types, and may not necessarily reflect a substantively different archaeological culture to others from the same period in North Africa. The findings are significant because they suggest that current archaeological nomenclatures do not reflect the true variability of the archaeological record of North Africa during the Middle Stone Age from the Last Interglacial, and hints at how early modern humans dispersed into previously uninhabitable environments. This notwithstanding, the term still usefully denotes the presence of tanged tools in North African Middle Stone Age assemblages. Tanged tools persisted in North Africa until around 30,000 years ago, with the youngest sites located in the Maghreb. By this time, the Aterian lithic industry had long ceased to exist in the rest of North Africa due to the onset of the Ice Age, which in North Africa, resulted in hyperarid conditions. Assemblages with tanged tools, 'the Aterian', therefore have a significant temporal and spatial range. However, they have not yet been found east of the Nile and no Aterian sites are known from the Nile Valley. The Aterian is associated with early Homo sapiens at a number of sites in Morocco. Some studies of comparative skeletal morphology have suggested that these people exist on the same morphological continuum as the Jebel Irhoud specimens, currently thought to date to 160,000 years ago. The 'Aterian' fossils also display similarities to the earliest modern humans found out of Africa at Skhul and Qafzeh in the Levant, and they are broadly contemporary to them. Apart from producing a highly distinctive and sophisticated stone tool technology, these early North African populations also seem to have engaged with symbolically constituted material culture, creating what are amongst the earliest African examples of personal ornamentation. Such examples of shell 'beads' have been found far inland, suggesting the presence of long distance social networks. Studies of the variation and distribution of the Aterian have also now suggested that associated populations lived in subdivided populations, perhaps living most of their lives in relative isolation and aggregating at particular times to reinforce social ties. Such a subdivided population structure has also been inferred from the pattern of variation observed in early African fossils of Homo sapiens. Associated faunal studies suggest that the people making the Aterian exploited coastal resources as well as engaging in hunting. It has so far been difficult to estimate whether Aterian populations further inland were exploiting freshwater resources as well. Studies have suggested that hafting was widespread, perhaps to maintain flexibility in the face of strongly seasonal environment with a pronounced dry season. 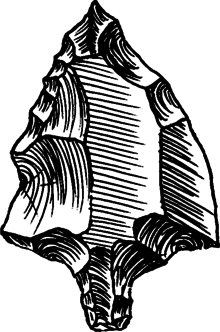 Scrapers, knives and points all seem to have been hafted, suggesting a wide range of activities were facilitated by technological advances. It is probably that plant resources were also exploited. Although there is no direct evidence from the Aterian yet, plant processing is evidenced in North Africa from as much as 182,000 years ago. Aterian lithic tools have also been discovered in Middle Paleolithic deposits in Oman and the Thar Desert. 1 2 Richter, Daniel; Moser, Johannes; Nami, Mustapha; Eiwanger, Josef; Mikdad, Abdeslam (2010-12-01). "New chronometric data from Ifri n'Ammar (Morocco) and the chronostratigraphy of the Middle Palaeolithic in the Western Maghreb". Journal of Human Evolution. 59 (6): 672–679. doi:10.1016/j.jhevol.2010.07.024. 1 2 3 4 5 6 Scerri, Eleanor M. L. (2013-06-25). "The Aterian and its place in the North African Middle Stone Age". Quaternary International. The Middle Palaeolithic in the Desert. 300: 111–130. doi:10.1016/j.quaint.2012.09.008. 1 2 Bouzouggar, Abdeljalil; Barton, Nick; Vanhaeren, Marian; d'Errico, Francesco; Collcutt, Simon; Higham, Tom; Hodge, Edward; Parfitt, Simon; Rhodes, Edward (2007-06-12). "82,000-year-old shell beads from North Africa and implications for the origins of modern human behavior". Proceedings of the National Academy of Sciences. 104 (24): 9964–9969. doi:10.1073/pnas.0703877104. ISSN 0027-8424. PMC 1891266 . PMID 17548808. ↑ Dibble, Harold L.; Aldeias, Vera; Jacobs, Zenobia; Olszewski, Deborah I.; Rezek, Zeljko; Lin, Sam C.; Alvarez-Fernández, Esteban; Barshay-Szmidt, Carolyn C.; Hallett-Desguez, Emily (2013-03-01). "On the industrial attributions of the Aterian and Mousterian of the Maghreb". Journal of Human Evolution. 64 (3): 194–210. doi:10.1016/j.jhevol.2012.10.010. ↑ Iovita, Radu (2011-12-27). "Shape Variation in Aterian Tanged Tools and the Origins of Projectile Technology: A Morphometric Perspective on Stone Tool Function". PLoS ONE. 6 (12): e29029. doi:10.1371/journal.pone.0029029. PMC 3246439 . PMID 22216161. 1 2 3 Scerri, Eleanor M. L.; Drake, Nick A.; Jennings, Richard; Groucutt, Huw S. (2014-10-01). "Earliest evidence for the structure of Homo sapiens populations in Africa". Quaternary Science Reviews. 101: 207–216. doi:10.1016/j.quascirev.2014.07.019. ↑ Scerri, Eleanor (2012). "A new stone tool assemblage revisited: reconsidering the 'Aterian' in Arabia". Proceedings of the Seminar for Arabian Studies 42. ↑ Hublin, J.-J. ; Verna, C.; Bailey, S.; Smith, T.; Olejniczak, A.; Sbihi-Alaoui, F. Z.; Zouak, M. (2012-01-01). Hublin, Jean-Jacques; McPherron, Shannon P., eds. Dental Evidence from the Aterian Human Populations of Morocco. Vertebrate Paleobiology and Paleoanthropology. Springer Netherlands. pp. 189–204. doi:10.1007/978-94-007-2929-2_13. ISBN 978-94-007-2928-5. ↑ d'Errico, Francesco; Vanhaeren, Marian; Barton, Nick; Bouzouggar, Abdeljalil; Mienis, Henk; Richter, Daniel; Hublin, Jean-Jacques; McPherron, Shannon P.; Lozouet, Pierre (2009-09-22). "Additional evidence on the use of personal ornaments in the Middle Paleolithic of North Africa". Proceedings of the National Academy of Sciences. 106 (38): 16051–16056. doi:10.1073/pnas.0903532106. ISSN 0027-8424. PMC 2752514 . PMID 19717433. ↑ Gunz, Philipp; Bookstein, Fred L.; Mitteroecker, Philipp; Stadlmayr, Andrea; Seidler, Horst; Weber, Gerhard W. (2009-04-14). "Early modern human diversity suggests subdivided population structure and a complex out-of-Africa scenario". Proceedings of the National Academy of Sciences. 106 (15): 6094–6098. doi:10.1073/pnas.0808160106. ISSN 0027-8424. PMC 2669363 . PMID 19307568. ↑ Stoetzel, Emmanuelle; Marion, Lucile; Nespoulet, Roland; El Hajraoui, Mohammed Abdeljalil; Denys, Christiane (2011-01-01). "Taphonomy and palaeoecology of the late Pleistocene to middle Holocene small mammal succession of El Harhoura 2 cave (Rabat-Témara, Morocco)". Journal of Human Evolution. 60 (1): 1–33. doi:10.1016/j.jhevol.2010.07.016. ↑ Van Peer, P; Fullagar, R; Stokes, S; Bailey, R. M; Moeyersons, J; Steenhoudt, F; Geerts, A; Vanderbeken, T; De Dapper, M (2003-08-01). "The Early to Middle Stone Age Transition and the Emergence of Modern Human Behaviour at site 8-B-11, Sai Island, Sudan". Journal of Human Evolution. 45 (2): 187–193. doi:10.1016/S0047-2484(03)00103-9. ↑ Gwen Robbins Schug, Subhash R. Walimbe (2016). A Companion to South Asia in the Past. John Wiley & Sons. p. 64. ISBN 1119055474. Retrieved 5 May 2016. ↑ Bouzouggar, Abdeljalil; Barton, R. Nicholas E.; Igreja, Marina De Araujo (2007-01-01). "A brief overview of recent research into the Aterian and Upper Palaeolithic of northern and eastern Morocco". ↑ Barton, R. N. E.; Bouzouggar, A.; Collcutt, S. N.; Schwenninger, J. -L.; Clark-Balzan, L. (2009-09-01). "OSL dating of the Aterian levels at Dar es-Soltan I (Rabat, Morocco) and implications for the dispersal of modern Homo sapiens". Quaternary Science Reviews. 28 (19–20): 1914–1931. doi:10.1016/j.quascirev.2009.03.010. ↑ "El Akarit : un site archéologique du paléolithique moyen dans le sud de la Tunisie in SearchWorks". searchworks.stanford.edu. Retrieved 2016-08-04. Wikimedia Commons has media related to Aterian.